In July 2018, Eventful Limited held its first ever The Fashion Souk which was a phenomenal success to both vendors and all who attended. 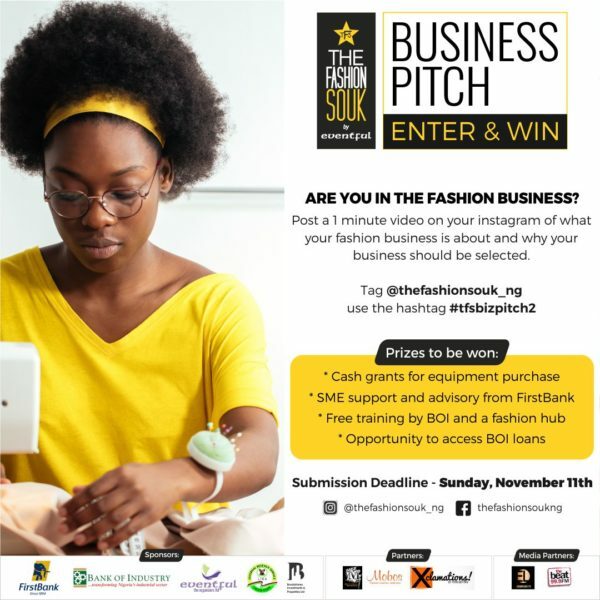 One of the most exciting features of the Souk was the Business pitch where the top 3 winners were rewarded with equipment grants and more, with renowned Fashion Designers such as Deola Sagoe of House of Deola Sagoe, Folake Coker of Tifanny Amber, Eme Akenzua of John3v3, Otumine Nelson-Moore of Otumemine Couture as judges alongside Folake Ani-Mummuney – General Manager of First Bank and Subu Giwa of Brookstone Property, sponsored by First Bank and the Bank of Industry. Are you in the Nigerian fashion business producing unique and amazing products across the entire value chain in clothing, bags, footwear, millinery, jewellery, lingerie or accessories? Fashion Souk is looking for more home-grown businesses to empower and propel in the path of success. Submission deadline is Midnight, Sunday, November 11th, 2018. For more information visit our Instagram page: @thefashionsouk_ng. Pre-Order the New HUAWEI nova 3i & Stand a Chance to Win N10,000 Worth of Vouchers! Hey Buddy!, I found this information for you: "Can You Create Unique Fashion Designs? Here’s an Opportunity to win Equipment Grants & More in The Fashion Souk Business Pitch Competition". Here is the website link: https://headlinenews365.com/can-you-create-unique-fashion-designs-heres-an-opportunity-to-win-equipment-grants-more-in-the-fashion-souk-business-pitch-competition/. Thank you.